Welcome to our Superpoker tables, for ring game and tournament play. One of the first things you’ll notice on our ring game or tournament tables is the large action buttons. 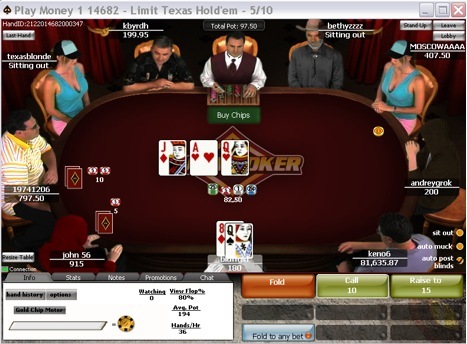 This is the main part of the action section; however there are more tools and features available to you depending on the game format you’re playing – No Limit, Limit or Fixed Limit. We allow you to choose from a number of realistic characters when seated at a gaming table. In fact, they are quite realistic and move with your actions including a ‘hands at their side’ action should you sit out, or a ‘lean forward’ while you’re in the game. If you’re playing online to avoid people, Superpoker also offers the option to remove characters from game play as well as an optional ’simple’ background. One of the first thing you’ll likely notice, and likely the most important game interface took, are the large action buttons. These are large buttons displayed in multiple colors. When it’s your turn to act, simply select the button that describes how you’d like to act – Fold, Check or Bet. If you’re choosing to Bet, be sure to read below on your options should you be playing a pot limit or no limit game. When you have a turn coming, but it’s not yet your turn to act, the Pre-Action Buttons will appear. Clicking these will toggle an action to be performed automatically when it’s your turn. When raising the bet, there are a few more options available to you. Our three quick raise buttons, allow you to raise ½ pot, the entire pot amount or go all-in, depending on your game format (i.e. Pot Limit or No Limit). If you choose to change the amount of the standard raise amounts, our slider bar is your ticket to increasing the action! Simply use your mouse to pull the bar to the right, to increase the bet. If you have an exact amount in mind, you may also choose to simply type the amount in directly to the white text box. 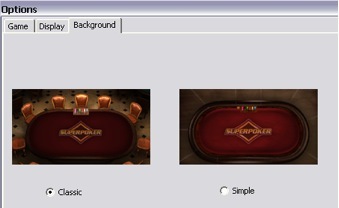 Superpoker’s interface has four distinct tools shown in tab format, on the bottom left of your table game screen: Chat, Notes, Stats and Info. Each of these tools will allow you to view different elements about the game while observing or playing at the table. Within these tabs, Chat will automatically be shown as your default view point. Here you’ll see a review of the table action, including Dealer Chat, Announcements, and of course, player’s chat. If you wish to make a comment to players at the table, simply start typing your text in the white space and hit enter to post. We only ask that you keep your comments friendly, and of course, don’t discuss your hand while it’s still in play. Chat is color coded so you’ll be able to easily determine the importance of a message. Using the Options window, accessible via the bottom right button you see below, you can segment off Chat if you wish. Your options will include silencing the Dealer, our summary setting which provides only basic hand details or everything (default) which will display all incoming messages and chat. 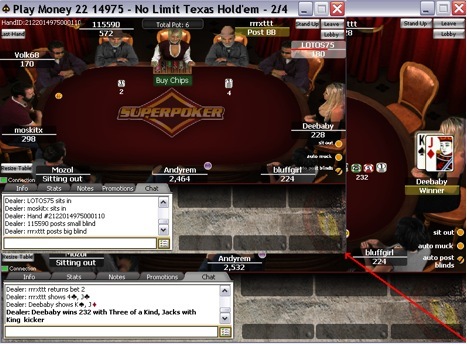 You can also choose to view Chat only from Players, and not from Observers or railbirds. Looking to shut a player up? Using the Notes tab, you’ll have the option to select a player seated at the table and mute them, by clicking ‘ignore’. 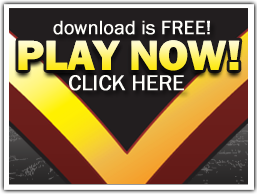 The Notes tab, allows you to make notes about a players game that may be helpful to your game should you meet them again at the Superpoker tables. Players at your table will be listed within the drop down menu. Choose a player and write notes within the text box as per below. We’ve also made some easy to use Rating Icons for quick and easy tagging of players. When playing at a table, the Stats tool will track your game play information. You can reset your stats when you feel necessary (i.e. if you’re trying a new strategy). - Time Bank time remaining for player. Choose your own table size with our resizable table option located on the bottom left of every gaming table. Create the screen of your choice by pulling & dragging the screen to your perfect size, or select our ready to go tiling, cascade, minimize or maximum sized options. Don’t like to see people in your table? Try our ’simple’ table view minus those pesky avatars. To make the switch, click on the Dealer’s chip tray and choose the Background tab. You’ll now find two table options available, classic and simple.